Last week saw the announcement of the nominations for the 2019 Virgin Media British Academy Television Awards and British Academy Television Craft Awards, honouring the best in television craft and the television programmes broadcast in the UK in 2018. 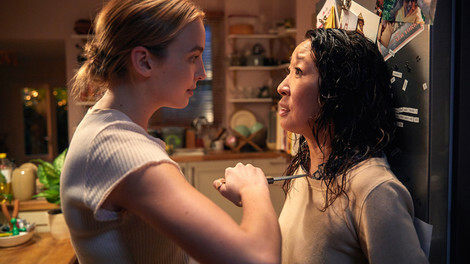 Leading the pack are two shows filmed extensively in London - Killing Eve, starring Sandra Oh and Jodie Comer, received 14 nominations including Drama Series, Leading Actress, Supporting Actor, Supporting Actress and Director. A Very English Scandal received 12 nominations for categories including Costume Design, Director Fiction, Editing Fiction, Make-up & Hair Design, Original Music, Production Design, Sound Fiction, including a first-time nomination for Hugh Grant for Television, in the category of Leading Actor. Also filmed in London are the Benedict Cumberbatch-led drama mini-series Patrick Melrose, which received six nominations for Original Music, Photography & Lighting Fiction, Production Design, Writer: Drama, Leading Actor, as well as Bodyguard and Park Chan Wook's The Little Drummer Girl, which received 5 each, including Production Design, Make Up and Hair Design, Original Music and Photography and Lighting: Fiction. Netflix's acclaimed interactive drama Black Mirror: Bandersnatch, also shot in London, received multiple nominations, in the Single Drama category as well as Visual Effects. The British Academy of Film and Television Arts (BAFTA) is a world-leading independent arts charity that brings the very best work in film, games and television to public attention and supports the growth of creative talent in the UK and internationally. The Virgin Media British Academy Television Awards ceremony will be held at the Royal Festival Hall on Sunday 12 May with the British Academy Television Craft Awards taking place two weeks earlier on Sunday 28 April at The Brewery, London.